Read our Code of Conduct and join our Discord server if you want to chat! A lightweight terminal made with OpenGL from the ground-up. With this terminal, you're able to make the terminal applications or games you've always wanted, but with a terminal that looks the same for everyone, because it's made with OpenGL and doesn't use the computer's native terminal! Changing foreground and background colors to whatever you want! A text-parser that will make it easy to write whatever you want and make it look cool! 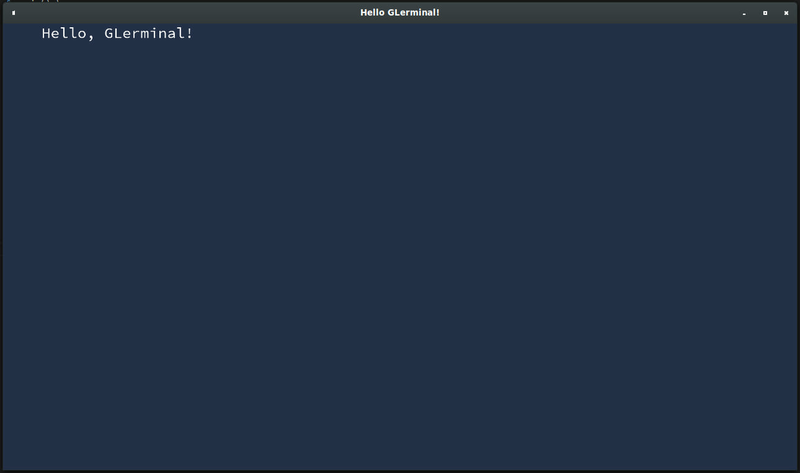 Parseable text example: "Hello, [fg=red]this is red[/fg] and [shake=1.0]this is shaking[/shake]." Extensive documentation can be found at: docs.rs. The default font that comes with GLerminal is a render of Source Code Pro and only includes a few more popular unicode blocks, to save space on the end product (the default font is compiled into the library). To make a custom font, you have to use either the BMFont standard / .fnt, or .sfl, and software that can produce such files are BMFont (can produce only .fnt), or Fontbuilder (can produce both). The font image needs to be RGBA PNG. It is advised to use Fontbuilder, as (at least after some testing) the png font images generated by BMFont (and their antialiasing) are sub-par compared to Fontbuilder, though Fontbuilder might be difficult to build on windows devices (It is possible with MinGW though). Note If using Fontbuilder, it is highly recommended to use this fork as it contains a critical fix for .sfl font exporting. After that it is advisable to look at glerminal font documentation on how a custom font is then loaded to use. You are welcome to contribute to this project, but before do review the Contributing guidelines. A Code of Conduct can also be found in the repository as CODE_OF_CONDUCT.md, please review it before interacting with the community. This crate is distributed under the terms of the MIT License. This crate also uses a font as a default font, called Source Code Pro, which is distributed under the terms of SIL OFL Version 1.1.